Free “How To” Guide Included! A working mom that is separated from her child during the day to go to work. That’s the kind of working mama I am. If you are a trying to figure out how to squeeze in the most bonding time in with your new baby then keep reading. Here’s a plot twist, you matter too, not just the baby! I’m going to give you some tips on how to rock maternity leave and treat yourself in the process. When I returned back to work full time I could easily have 10 hours of separation once you add in travel time and a lunch break. This separation is why a lot of mamas have trouble keeping their breast milk supply up when returning to work. It’s also why my separation anxiety hit me like a ton of bricks when I least expected it. It’s okay, if this is you just breathe. I am going to give you simple tips on how to ease this feeling. Maternity leave looks different for everyone and can carry it’s own stress. 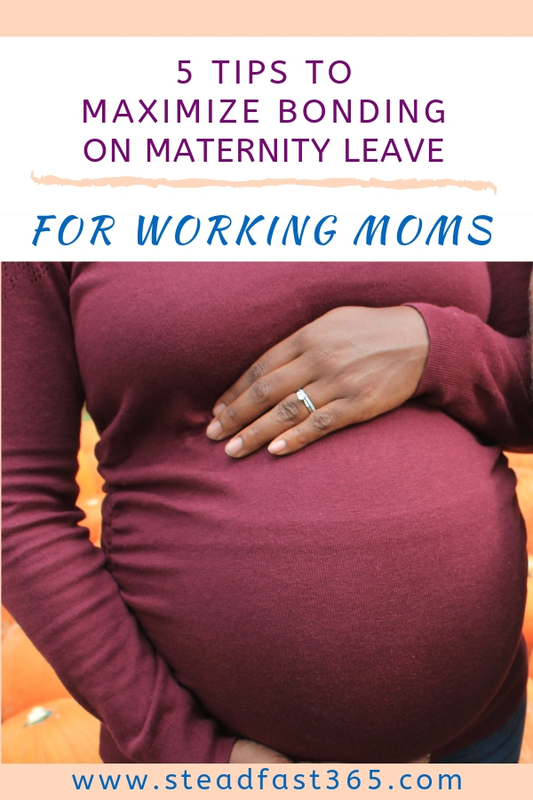 Not all maternity leave is job protected, paid or health insured. Physicians will typically give 6 to 8 weeks of healing time for your body based on your delivery. I was blessed to have enough vacation and sick time saved up to take 12 weeks, but that’s rare and still a small amount of time. My goal was to maximize every bit of quality time with my baby that I could and here’s how you can too. I didn’t really consider being a stay at home mom. I don’t see anything wrong with going that route, it just never really occurred to me. So many times while pregnant I was asked “ what are you going to do about work when you have the baby?”My first reply without thought was “Oh, I have maternity leave.” The next question was always “and then what?”. At this point they were either throwing judgement for me going back to work, or they genuinely wanted to know how I was going to raise a baby and work. Either way, these imposing questions got me thinking. I knew that I was returning to work in 12 short weeks, so my plan was to squeeze in as much quality time as I could before returning and then planning for the same thing after I return. Have you come across any of this? Okay, so the first thing I want you to do is consider the source and intention. Maybe they truly mean well, but they still need to respect your boundaries so make sure you set them. After that point if it continues then let it go and live your best life. You can only control your reactions. When on maternity I without apology, hogged my baby! Yes, there were many times when I needed a family member to relieve me for a while. My time with my baby is just that its mine. I was just like an 18 month old that learns the power of saying “mine” lol. I only shared when I wanted. To this day my baby is super attached to me even though I have childcare while I work. Now I will put you on notice that people may feel like they cant see your precious baby that much. They are right, but to expect a working mom who wont get to see her baby that much to give up or share her time before she’s ready is not fair. I didn’t get any flack for that at least not to my face lol. I know of other moms that got a lot of push back from people for not sharing their baby. First be grateful that people even want to spend time with your baby. It’s coming from a place of love. However, you’re the one that has to go back to work in 6 weeks, 8 weeks, 6 months, 1 year, or whatever. Therefore, your time is limited and you only get it once so use it however you see fit. It flew by for me. It’s your baby! You don’t need anyone’s permission. You will hear different opinions on this one. It’s been said that if you hold them all the time or every time they cry that you’re spoiling them. I decided to go with my gut. Mother’s intuition is real and I’ll leave it at that. If you’re snuggling skin to skin that’s a bonus. Dads can do it too! My baby needed to be held a lot. Like a whole lot. I loved holding my baby. I would hold him or put him in a carrier and go about my day. I’m glad I got all that snuggle time because he started crawling at 6 months and walking at 9 months. He preferred to get down and explore. No two babies are alike as discussed in this comparison article. If you have a colicky baby then your story may be different and that’s okay. Do it! Do it! Do it! You are allowed mama. This one is way too often neglected. Bonding can be a lot of work. Taking care of yourself and your mental health is key. You need to recharge the mental energy to keep the bond going. I was so into taking care of the baby and forming a bond that I neglected spoiling myself. Notice I said spoiling. Not just taking a little moment and rushing back, but actually spoiling myself. I didn’t take advantage of this until well into my maternity leave. I just did this huge thing. Ya know, making a human and all. Operation spoil myself was in order! Once I realized that maternity leave was about more than the physical healing and bonding it was like a light bulb came on. My ah-ha moment! Your healing process involves mental health healing as well. If you’re feeling the baby blues here are some natural self care ideas to boost your happy hormone. So if you have friends or family that can watch your baby for a few hours while you take some time for yourself then do it. What if you don’t have a baby sitter? If you need to put the baby in daycare as you heal up and get yourself together before returning to work then you do that. There is no shame in that! My baby HATED the car seat, so this one was limiting! Doing things like grocery store trips, going to lunch, browsing through a kid friendly museum. You would be surprised what it’s like doing the below activities outside of the home for the first time. I found it to not feel so foreign when I went back to work and started doing these things. Especially on days when I was stressed. These daily activities felt normal at that point and reduced all the changes happening. Plus I really enjoyed the feeling of spending time with my new baby. You knew this day would come. It’s getting closer to the time to return to work and the anxiety kicks in. Or maybe just the feeling of missing your baby. If this is you, then you may want to transition for that last week with childcare. This is another piece of the postpartum journey that gets overlooked. 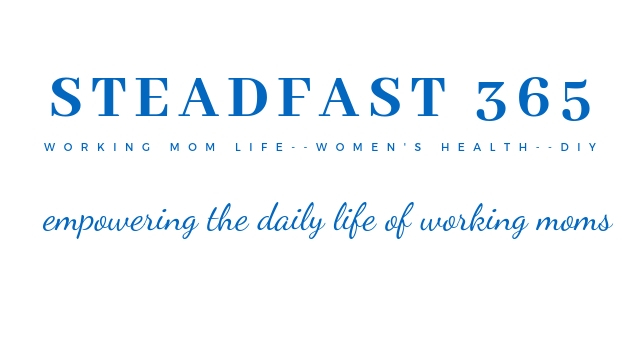 For some moms it is HARD to return to work even though we want or need to. This is a great time to focus on self care! If you’re anything like me you will have a different schedule, body, sleep pattern, and focus. Practice your morning work routine with your baby. Actually drop them off and go about your day. Pick them up when you plan to after work. Mom confession : I did this and still cried on my way in to work on that first day back but I made it through the day. I kept checking in on my baby and he was perfect. It still helped having a routine and having an idea of what to expect. Keep your head up you workin’ mama you! You’re rocking work, taking care of the home AND raising your kids. Just like no two babies are the same, maternity leave will vary for every mom. You can have it all planned out and your baby may require something different. My hope is that these 5 tips will help you maximize that special bonding time that goes so quickly. 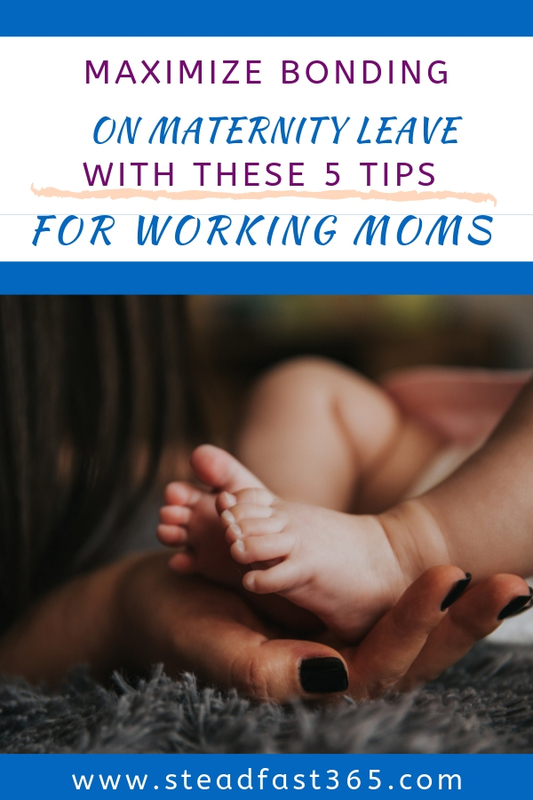 Share this article with someone that may be going on maternity leave if you found it helpful. Do you have any other tips? Have you ever tried any of the 5 tips I listed? Leave a comment and let me know. I would love to hear your thoughts on this. You would be helping out other mamas too! 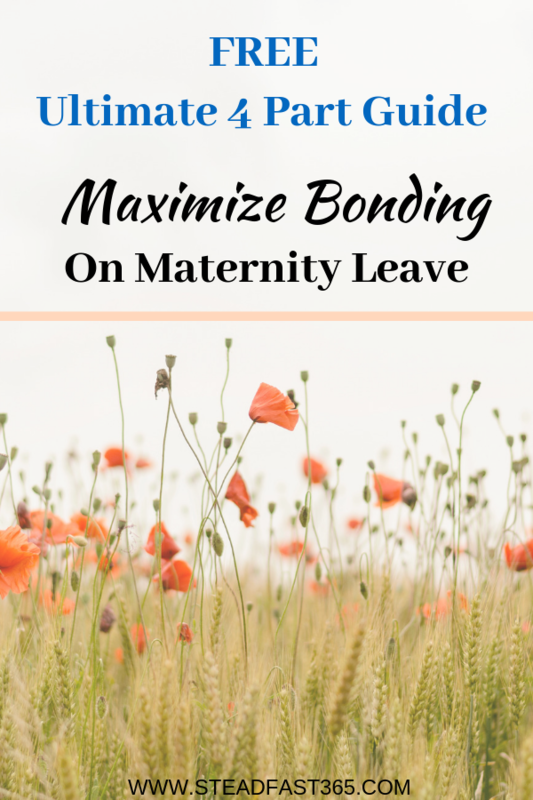 Click to instantly download your FREE Ultimate Guide To Maximize Bonding On Maternity Leave!